French Riding Holidays on Inn to inn riding vacations through the heart of Provence and week-long training and trail vacations. Ride in classic French countryside made famous by best-selling author Peter Mayle and painted by Cezanne. Horse ride amid vineyards and beaches and to hill towns, savoring Provencal food, wine, history and horses. See the wild, white horses of Camargue. Visit historic towns with stunning stone buildings and chapels, Wine taste in French cellars. Feast on fresh regional cuisine and culture. Most rides are for intermediate to advanced riders. Beginners may choose the Training & Trails vacation to improve their riding skills and confidence on the trails. On inn to inn rides, expect to ride an average of five hours every day. The pace will vary according to the terrain with opportunities to walk, trot and canter. Lunches include substantial homemade Provencal cuisine and meals include wine. Enjoy local foods and products, including delectable olive oil, wines and cheese. Visit historic churches, wine cellars and towns by day, passing through fields of lavender, vineyards or oak forests. In the evenings, sit around the table with your new friends to enjoy the treasures of Provence! During progressive rides, this outfitter recommends bringing one bag weighing a maximum of 30 pounds. Extra luggage can be left at the main lodge. Laundry facilities are not available on site or nearby. Helmet- Please note- Bring your own helmet. See EquitrekkingTravel.com's General Packing List. Your travel companions, the horses, are Spanish or Barb mixes, used to the area terrain and life in Provence. The horses are well balanced and forward going. They live in a herd outdoors, so get a good mix of freedom and time to be horses as well as time with riders on the trail. The saddles are designed for trail riding and allow a laid back style of riding. Located in the Luberon Nature Park, nature and villages are very "French" and well preserved. • Hiking and biking. The main lodge for many of these rides is located at the confluence of many hiking trails. • Hiking or biking accompanied by a local guide is available for groups staying at the main lodge. • Rock climbing in Buoux (15 km) and Orgon (20km). Accommodations are in guesthouses, inns or small, local hotels, depending on the ride. Travelers may stay in simple but comfortable bedrooms with private showers and toilet or dormitory style rooms. Accommodations are selected according to their beautiful setting and friendly atmosphere. Much of the horseback riding in France is centered around a guesthouse located in the heart of Provence in the Luberon Regional Nature Park, at the south foothill. Set amid beautiful Provence scenery, this old farm has been carefully restored. The accommodations are simple, not luxurious, but comfortable and friendly and built for family life. Two kinds of accommodations are available: dormitories with bunk beds and shared bathrooms or private bedrooms with a private bathrooms. There are two dormitories with 6 bunk beds, a large dining room with a fireplace, bar and cozy little lounge. Shared bathrooms. There are five individual bedrooms with a shower and toilet located in a separate building with private terrace. 5 bedrooms for 1 to 3 people with views of the Luberon. Bed and Breakfast or half board available. Travelers eat together in the stone covered dining rooms or in the garden under cherry and pine trees. In these comfortable settings, dine on local Provencal cuisine, prepared by an area chef. Vegetarian options are available and wine is included! Intermediate and advanced riders who want to travel inn to inn and improve their horsemanship skills by taking a training vacation. Travelers interested in learning French, exploring Provence history and culture, and enjoying great food and wine on their trip. Beginning riders who want to improve their riding skills in a beautiful setting in Provence. These riding holidays are suitable for groups, families and single travelers. Spend a week in the area that inspired author Peter Mayle and the painter, Cezanne. Ride through idyllic vineyards, mountains and valleys, tasting wine and eating Provencal cuisine on this France riding holiday. Great for intermediate to advanced riders, who want the comfort of a mainly stationary ride with a two day trek, where you'll stay one night at a charming inn, amid the beautiful Luberon Regional Nature Park. For one person willing to share bedroom(s), half single supplement rate will be applied if we don’t have anybody to share, refunded if we get an other rider willing to share before departure. Full single supplement will be applied for last minute bookings (less than 21 days before departure) if we don’t have anybody to share. Price includes: transfers to/from train station or airport (Aix-en-Provence TGV station, Aix-en-Provence center train station, Marseille airport), guided trail rides, all meals, horse, tack, luggage transfers, tax. Price does not include: drinks (apart from some wine at meals), individual insurance, tips. Intermediate to Advanced riders. Must be able to walk, trot and have short canters. A guesthouse located in the heart of Provence in the Luberon Regional Nature Park. Set amid beautiful Provence scenery, this historic farm has been carefully restored. One night is spent in an inn in the heart of the Luberon hills. Meet your guide, chef and all of the team at the Provencal farm where the stables are locates. Learn about the week's France riding holiday and enjoy your first Provencal meal. Get acquainted with your horse and learn about how to tack up and take care of your horse for the week. Try a short hack in the surrounding area to get used to your mount and take in the surroundings. Enjoy lunch and then ride to discover the hills of Luberon, which are blanketed in dense oak forests. Today you'll ride for approximately one hour in the morning and an two hours in the afternoon. Today is your first full day ride. Start out in the morning and trek on horseback through a pine forest, traveling down toward the Durance Valley, an important historic trade route that influenced the history of Provence and the Luberon region. The Durance River, a tributary of the Rhone River, is known for its pristine, clear waters. The banks of the Durance River are a great place to have a short canter. Enjoy lunch prepared by the chef, picnic style by the river. Take a break to stretch your legs and let the horses have a rest. You may even take a nap or decide to swim with your horse! In the afternoon, ride back to the lodge through forests, cherry orchards and picturesque vineyards. Today, your riding adventures take you through pine tree-covered hills and along olive trees, vineyards and other fruit trees with a stop in a cave for a wine tasting. You're traveling on horseback to an area wine cellar, where you may taste local Luberon Wine! In the afternoon, go out for another ride or choose to relax at the lodge's garden, take a trip by minibus around the Luberon Regional Natural Park or visit Provence villages-- Lauris, Lourmarin and Ansouis. The Luberon Regional Natural Park covers almost 500 square miles of varying terrain and environments, including white and red cliffs, cedar, oak and pine forests and exposed moorland. Start off for a two-day ride in the Luberon Regional Natural Park. The morning ride may take you towards Lourmarin, touted as "one of the most beautiful villages in France", through Provencal landscapes of olive trees, cherry orchards and Mediterranean forests. Tonight will be spent at an inn in the heart of the Luberon hills. Head back to the main lodge following the Aiguebrun stream, which divides Luberon in two. Admire beautiful views on the Durance Valley and the surrounding hills, including the Montagne Sainte Victoire, known as Cezanne’s mountain. Arrive at the lodge in the late afternoon and take good care of your horse before letting him loose for a well deserved rest. Enjoy recounting your trip and adventures at a dinner party for your last night at the lodge. Depart for home or other parts of France after breakfast. For further riding or other itineraries, please contact Equitrekking Travel's Preferred Travel Agent. Enjoy riding, shopping, eating and living life to the fullest, French style, on these fall and winter rides in Provence. Explore countryside made famous by Cezanne and best-selling author Peter Mayle. Those who wish can combine riding with French lessons! Price includes: guided trail rides, meals (except Tuesday lunch), horse, tack, transfers to/from Aix-en-Provence train stations or Marseille Airport at pre-set times, taxes. Does not include: drinks apart from some wine at meals, admission fees for local visits (Cezanne’s work studio), Tuesday lunch in Aix-en-Provence, individual insurance, tips. Spend nights on this stationary ride in a lovely French farmhouse. Choose a bedroom or dormitory style room. Single bedroom or upgrade accommodations available with supplemental fee. You'll be collected at the airport of train station and taken to the French guesthouse from which you'll be based for this stationary ride in Provence. The guesthouse is a lovely French farmhouse. Get introduced to your accommodations and enjoy and aperitif in front of the fire. Learn about the week's riding vacation and enjoy your first Provencal dinner. In the morning, meet your equine partner and get acquainted on an introductory trail ride through the vineyards surrounding the farm. Enjoy a French lunch on the grounds of the farm and relax. In the afternoon, ride out for one and a half hours through the rolling hills of the Luberon Mountain Range. The scenery here is comprised of White Oaks, olive trees and the great perfume filled countryside of Provence. A wonderful dinner and a night in the farmhouse end your first full day in this scenic area of France. You're riding in "famous" French countryside. Besides Cezanne and author Peter Mayle, this area was where two famous Provencal movies, the 1986 “Jean de Florette” and “Manon des Sources” adapted from the novels of famous writer Marcel Pagnol, were filmed. "Jean de Florette" starred some of France's most prominent actors – Gérard Depardieu and Daniel Auteuil. These two movies will be shown for you in the evening following dinner. This morning, follow in the footsteps of Cezanne by minibus. Discover the most famous places painted by Cezanne in the Montagne Sainte-Victoire and around the great city of Aix-en- Provence, and visit his studio. Spend the rest of your morning in the famous Aix-en- Provence street market, the best place to buy local products and crafts. You're free to have lunch in one of the numerous café or restaurants in Aix, before meeting the group and being driven back to the farmhouse. You have the option to ride this afternoon in the surrounding area, among all the quintessential Provence herbs: thyme, rosemary, sage and wild lavender. End the day with dinner at the farmhouse. Ride to the Durance River bank for a lovely picnic lunch with aperitifs, cheese, salad, local pies, area wines and coffee. Riding into the hills, discover the entire Durance Valley, an important historic trade route that influenced the history of Provence and the Luberon Region. Take in the village of Lauris, perched high on a cliff. The ride back will be an easy one through area agricultural landscape. Discover the rich soil that helps the area produce such great wines, asparagus, olives, truffles, cherries, apricots, melons... the treasures of Provence. After you take care of your horse, enjoy a tasty Provencal dinner. Spend the morning discovering famous local products in the comfort of the guesthouse. Seated around a fire, taste olives, honey, grilled chestnuts and participate in preparing a typical Provence lunch. You'll try the famous truffle omelet, complete with local wines. In the afternoon, ride off those extra calories by taking a half day horse trek up to the crests of Luberon. Take in views of the surrounding hills and valleys and dramatic limestone cliffs and cedar forest. Return to the guesthouse in the afternoon. This morning you will visit Provencal villages such as Lauris and Lourmarin, Cezanne’s local market and where Peter Mayle – the Author of “A Year in Provence”, is now living. In the afternoon enjoy your last ride to a local cellar producing “Cotes du Luberon”. This little family cellar has been promoted by Robert Parker, the famous American Wine Writer. Don’t drink too much, just enjoy your taste, before riding through nice pine tree forests and bring your horse to the pasture, in the woods, where they will have a week-end rest. Last dinner in Provencal friendly atmosphere. After breakfast, transportation to train station or airport is organized. Ask us about extending your stay in Europe. * This riding holiday itinerary is flexible and subject to changes based on the weather, trip guide's discretion or other factors. In the heart of Provence, South of France, from the Luberon Regional Nature Park to the foot of Mount Ventoux, discover the heart of Provence. This trail riding vacation is filled with the light and scents of Provence and located half-way between the Alps and the Mediterranean. Along the way, you will travel through ancient villages and along fields of lavender. This ride deserves a special mention for the quality of the cuisine and accommodations. 21/07-27/07, 28/07- 03/08, 04/08-10/08, 11/08-17/08, 18/08-24/08, 25/08-31/08. Price includes: transfers to/from train station (Aix-en-Provence TGV station, Aix-en-Provence center train station, Marseille airport), guided trail rides, all meals, horse, tack, luggage transfers, taxes. Does not include: drinks (apart from some wine with meals), individual insurance, tips. You'll be transferred from the Marseille Airport (5pm) or Aix-en-Provence TGV station (5:30pm) or Aix-en-Provence Central Train Station (5:45pm). Meet your guide at the farmhouse and learn about the week's riding adventure as you have a welcome drink. Dinner at the farm. Meet your horse and tack up before riding towards the famous village of Lourmarin. Ride among olive groves, cherry orchards and stop by the village to take a look at its 12th century castle. Lourmarin was home to renowned French writer Albert Camus and hit the world stage more recently as the subject of a series of books by author Peter Mayle. Mayle wrote "A Year in Provence" among other fun, books. Enjoy a beautiful lunch near the village. Feast on local cuisine. In the afternoon, ride trails up to the crests of the Luberon Mountain Range. On top, take in stunning landscapes. You'll be able to see the Alps and the Mediterranean Sea. Night in a stone Auberge in the heart of the Luberon. Day 3: Sivergues - Cereste. Ride through the prehistoric sites of the “Gorges de l’Aigebrun”. Pass through a very pretty provincial village to offer the horses a drink at the fountain. Picnic under the oaks, then follow bridleways though the perfumed garrigues to reach Cereste, an old Roman village and the gateway to Upper Provence. Spend the night in a farmhouse or a hotel in the heart of the village. This morning, your first stop will be the Priory of Carluc. Discover this 12th century building and the remains of the chapel and necropolis. You will then leave the Luberon area to towards the magnificent village of Oppedette, perched on a cliff and overlooking an impressive canyon. Admire the stone built houses as your horse drinks from the fountain. This afternoon's ride takes you on flatter terrain to the village of Simiane-la-Rotunde, surrounded by picturesque fields of lavender. After a few nice canters, reach your guesthouse, a “chambre d’hotes” (bed and breakfast). Day 6: Saint-Trinit – Le Contadour - Lauris. The Lure Mountain. The morning ride is your introduction to the Alpine views of Haute Provence. The change in the landscape is subtle and refreshing. From your horse, enjoy the sumptuous views over the Luberon Mountain Range and the Southern Alps, an area covered with Chestnut trees often used in local goat cheese recipes. Riders will appreciate their horses’ stamina and surefootedness as horses climb to the Pas de Redortiers (alt. 3,800 feet). From there - appreciate a great view of the pre-Alps. The weather is cooler, the view outstanding and there is grass for your horse. You will ride along the ridges of the Lure Moutain and discover the “Jas” and “bories”, dry-stone constructions used by shepherds and travelers. You will end up the ride on the hillside of the Moutain, in Le Contadour where Jean Giono famous Provence writer used to leave. Transfer to Mas de Recaute with minibus. Dinner and night at the French farmhouse. After breakfast, get taken to the airport or train station or contact us to make arrangements for other adventures in France. Follow Provene's lavender trails on a trip rich in fragrances and colors. Travel from the South Luberon to Provencal areas that are famous for their production of lavender. Trail ride the Plateau of Claparèdes, Plateau of Albion, the Country of Banon, to the foot of the Giant of Provence: The Mount Ventoux. A perfumed France riding vacation amoung Provence herbs. Price includes: Horse and tack rental, guide, assistant, accommodation, all meals, luggage transfers, transfer back to Lauris, transfers from/to Marseille airport, Aix-en-Provence TGV station, Aix-en-Provence center train station at pre-set times. Price doesn't include: Individual insurance, drinks out of meals, visits, tips. In hotels and guesthouses in 2-3 person bedrooms. Single bedroom available with supplement. Or in dormitories. Our assistant prepares nice buffets at picnics. Intermediate to Advanced. Must be able to walk, trot and canter on open trails. Meeting at Mas de Recaute around between 6pm and 7 pm, or transfer from airport or train station. Meet your guide and assistant who will tell you about the ride around a welcome drink. The ride starts on the southern side of the small Luberon. A small rocky trail will take you up on the hills of the Luberon. Nice view on the Mont Ventoux (localy called "the giant of Provence") and the Lure Mountain. A dense green oak forest will then guide you towards the Plateau of Claparèdes, famous for its lavender production. Lunch in the hills. On the afternoon, you will ride down to the Aiguebrun Gorges, the border between Small Luberon and Big Luberon. Day 3: Buoux - Simiane la Rotonde. This morning you are riding back up on the Plateau of Claparèdes, follow lavender fields, dry stone walls and " bories " (small shepherds' pen). You will stop in the perched village of Saignon to water the horses at the fountain. Ride down towards the Valley of Apt on ancient paved trails. After lunch you will follow a forest trail above the ochres of Rustrel and Gignac, before climbing the Vaucluse Mounts, across a dense white oak forest. Beautiful view on Simiane la Rotonde perched village and its fields of lavender. Dinner and night in a guesthouse. Day 4: Simiane la Rotonde - Saint-Trinit. After taking our breakfast, we will be driven to the village, to discover its donjon, its narrow little streets, its local shop, and its local “chestnut beer”. Then, we will ride up the Albion Plateau, which will offer us great opportunities for canters and more and more fields of lavender. Discover the forest of chestnut trees and its different use: the chestnut beer and the famous goat cheese of “Banon”, wrapped in chestnut leaves. Lunch by a meadow, under oak trees. After a good nap, we will ride to the village of Revest du Bion. Stop at the fountain to water your horse, and why not stopping as well for a drink at the local bar ? After this last stop, ride in an enchanted stretch of Provence’s natural beauty to a farm near St Trinit, where the comfort of a host table and a swimming pool welcome us. Day 5: Saint-Trinit - Montbrun-les-Bains. After breakfast, we will be driven to visite Sault the Provence capital of lavender. Then we will ride in direction of Saint-Trinit. The lunch will wait for us in the shade near Sault. In the afternoon, we leave in the direction of Aurel, charming medieval village at the foot of the Mount Ventoux. In the afternoon, the colors of lavenders, fields of cereal and the shadows of the Mount Ventoux may tempt you to imitate the numerous painters who felt in love with this region. We will arrive late the afternoon near Montbrun-les-Bains, surrounded with green hills and dominating a plain of perfumed lavenders: one of the most beautiful villages of France. Day 6: Montbrun les Bains - Buis les Baronnies. This morning, we follow the foot of the Giant of Provence: the Mount Ventoux. We follow the Toulourenc, pleasant refreshing stream, we cross the magnificent villages of Savoillan, Brantes and Plaisians and enter the Provence Drôme: an alternation of woods and lavenders. We ride towards Buis-les-Baronies where the truck and the minibus are waiting for our transfer back to Lauris, and Mas de Recaute. End of the ride after breakfast. Transfer to Marseille airport or Aix en Provence train station. Ride inn to inn through the picturesque Luberon hills and historic stone villages perched high above oak forests, lavender fields, vineyards and colorful cliffs. Written about in Peter Mayle's best-selling "A Year in Provence," this is one of the most exquisite natural areas in France. Stay in different guesthouses and inns each night and enjoy Provencal food and wines on your progressive trek through Provence. 22/07-27/07, 29/07-03/08, 05/08-10/08, 12/08-17/08, 19/08-24/08, 26/08-31/08, 02/09-07/09, 09/09-14/09, 21/10-26/10, 04/11-09/11. 22/07-27/07, 29/07-03/08, 05/08-10/08, 12/08-17/08, 19/08-24/08, 26/08-31/08, 02/09-07/09, 09/09-14/09. Price includes: Horse and tack rental, guide, assistant, accommodation, all meals, luggage transfers, transfers from/to Aix-en-Provence train stations and Marseille airport at pre-set times. Choose bedrooms or dormitory style rooms. Single rooms available with supplement. The Luberon Hills are one of the most exquisite destinations in Provence. With its forests of green and white oaks, limestone cliffs, and its typical stone villages, the Luberon region displays an authentic and picturesque landscape well described in the famous novels by best-selling author Peter Mayle. Discover the mysterious “Colorado Provencal." Fill your senses with the fragrance of lavender and Provencal herbs and be delighted by tasty Provencal cuisine. Transfer on Monday morning from the airport or train station to the equestrian center. Enjoy an introduction the Provence riding vacation and lunch. In the afternoon, you'll be introduced to your horse and start the trip through Luberon's rolling hills, towards the beautifull perched village of Bonnieux. The stone houses form a striking harmony of earth-toned colours and shapes. Some superb residences here date back to the 16th, 17th, and 18th centuries, serving as a reminder that Bonnieux was once a wealthy village. Several bishops chose to live here, and as you ride through the village streets, you will no doubt marvel at the architecture and history on display. Take a glimpse at Lacoste, the village of the sadly known Marquis de Sade. Beware and follow your guide very closely so you do not get lost anywhere near his castle. After the picturesque village of Bonnieux, the trail goes down in the Valley of the Aiguebrun River down high cliffs, well known by area climbers. Overnight in a nice Auberge along the river. Some of these have swimming pools. Undulating hills covered with nice pine forests, cherry orchards and vineyards encompass the Calavon valley. At lunch, feast on a nice buffet under pine trees, made with fresh local ingredients. In the afternoon, ride will go by the hills, breathing in Rosmary and Thyme, before heading to Rustrel. Ride in the bed of the Doa River and spend the night at a hotel in Rustrel. The horses will stay near the village for the night. Rustrel is the gateway to Provence's Colorado. The Provencal Colorado is a trail of red ochre sand with rock that reminds many travelers of Colorado. In the morning you will spend some time among the amazing colorful cliffs and hills. Heading back to the foothills of the Luberon, the itinerary will then take you through the beautiful village of Viens. You will then ride down to the Calavon River and spend the night in a guesthouse or in a hotel in Cereste. Thursday: From Cereste to Saignon. After breakfast, tour local markets. After preparing your horse, you will follow the foot of the Luberon, ride along vineyards, and all kind of froot trees: cherry, apricot, peaches all blooming in April and May. You will cross another charming perched village, Auribeau, before going down to the Aiguebrun rever and ride down cliffs in a green canyon before arriving to a typical stonebuilt guesthouse in the heart of the Luberon mountain. Ride up to the crests of the Luberon to discover an exceptional landscape and a view of the Alps to the North and the Mediterranean to the South. Then, ride down to Lourmarin. Enjoy a picnic and visit the village with its 12th century castle. This is the charming Provencal village that inspired the famous writer, Peter Mayle, who is now living near the village. Ride back to the equestrian center through olive trees and cherry orchards, with nice views on the Sainte Victoire Mountain, “Cezanne’s mountain”. Dinner at the farmhouse and overnight there or in a nearby hotel. Saturday: Your trip ends after breakfast. Transfer to Aix-en-Provence train stations or Marseille Airport. This amazing Inn to Inn riding vacation takes you from the mountains of Luberon, through scenery that inspired the artist Van Gogh, to the beaches of the Mediterranean Sea and Western Europe largest delta, the Camargue, known for it's nature, wildlife and beautiful white horses.A unique human and equestrian experience, a trip rich in history and culture, a week full of excitment as you will galop on the long beautiful sand beaches of the Mediterranean coast. Price includes: Horse and tack rental, guide, assistant, accommodation, all meals, luggage transfers, transfer back to Lauris, transfers from/to Aix-en-Provence train stations and Marseille airport at pre-set times. In hotels and guesthouses. Single bedroom available with supplement. Intermediate to Advanced. Must be able to walk, trot, canter and gallop on open trails. Ride at the foot of the Luberon mountain in pine and oak forests to the Durance valley where we will cross the river. Picnic on the other side of the Durance river. In the afternoon, ride along the Alpilles canal to the farm where the horses will stay for the night. Transfer with minibus to our lodging for dinner at the host’s table. Overnight in a bed & breakfast. (On certain dates, return to the farmhouse in the minibus). Day 3: Enter the Alpilles Nature Park. Make your way out of the valley towards Van Gogh’s country, les Alpilles. Reach the Roman village of Eygalière late in the afternoon, and stop by the beautiful Chapel St Sixte to take pictures. Dinner and overnight at a guesthouse near Eygalieres. A cultural day as you will ride in the landscape Van Gogh liked to paint. You will stop near Saint-Rémy-de-Provence, in front of the hospital in which Van Gogh stayed and made his most famous paintings. Admire beautiful Roman monuments, before you make your way towards lunch, by a gorgeous little lake, hidden in the hills. The afternoon ride will take you on the crests of the Alpilles : striking panorama on the surrounding area. We will even see the gleam of the mediterranean sea in the distance. At the end of the trail, discover a breathtaking sight on the medieval village of Les Beaux-de-Provence. Load the horses in the truck to meet them later on at the hotel... in front of your room! Visit of the village and transfer to Astouin, the gate of Camargue. Dinner and overnight in a typical Camargue house. You will take your first steps in the marsh land of the Camargue Nature Park: peacefulness, silence, stillness... You will feel lost in the wild, as you ride in this remote part of Camargue, off the toursist track. Admire the rich wildlife among which the pink flamingoes and herons. The flat terrain will allow you to enjoy long trots and canters, before you arrive to the village of « Les Saintes Maries de la Mer », right by the sea. You will have lunch by the hotel and give a well-deserved rest to your horse...and yourself, before jumping back on the saddle for an exciting ride on the beach. Beautiful canters and gallops, before heading back to your hotel. Shopping in the village and dinner in a restaurant. Overnight in a hotel near the village. Day 6: A stunning day ride to discover more of Camargue. Transfers to Aix-en-Provence train stations and Marseille airport or ask us about extending your stay. Finish the year riding under the famous sun of Provence. Day and half day rides in the Luberon Regional Nature Park's forests, along vineyards and olive and fruit orchards. Hot picnics will be brought to you at picturesque spots on the trail. Spend nights at the Mas de Recaute farmhouse and enjoy aperitifs with Didier, your host, in front of the fireplace. Exceptional dinners prepared by Chef Gaël and for New Years Eve, a memorable Provencal dinner and party. * US Prices are subject to changes based on currency conversions. Price is set from the Euro. Prices include: Horse and tack rental, guide, assistant, accommodation, all meals, new year's eve. Prices don't include: Individual insurance, drinks out of meals, visits, tips, transfers from/to Marseille airport and Aix-en-Provence train stations at pre-set times. 6 nights at our guesthouse at the equestrian center. You can choose either dormitory or 2-3 person bedroom. Single bedroom available with supplement. 6 dinners at our accommodation prepared by our chef. At lunch our assistant prepares nice buffets at our accommodation or at picnic places during day rides. Intermediate and advanced riders. You must be able to walk, trot and canter. 12/26: After airport or train collection, riders will gather at the “Mas de Recaute” your French Farm Home late in the afternoon. Introduction to your accommodation, an aperitif in front of the fire place, and presentation of the ride will mark the start of your week in Provence. Dinner at the host’s table. 12/27: A short hack to get you in the saddle in the hills around the Mas (Provincial farm). Two hours in the morning and two hours in the afternoon with a conducted tour of a cellar and a tasting of wines of “Cotes du Luberon”. Back to the farmhouse, you will enjoy a rest in front of the fire place before the dinner prepared by our chef. 12/28: Today, you will ride to the Durance river bank for a lovely picnic lunch with aperitif, cheeses, salads, local pies, local wines and coffee. Riding down the hills, you will discover the entire Durance valley, and take a glimpse at the village of Lauris, perched on its cliff. The ride back will be an easy ride through agricultural landscape. You will discover the rich soil that permits this area to get the best production of : wine, asparagus, olives, truffles, cherries, apricots, melons ... the Provence treasures ! 12/29: Half day off or morning trip in the minibus around the Luberon regional nature park: Lauris, Lourmarin and it's castle. Afternoon ride in the pine tree hills and along olive trees, vineyards and other fruit trees with a stop in a cave for a wine tasting. 12/30: Take off for a two day trail ride. Lauris - Pont Royal. Departure after breakfast to join the Durance valley with stunning views over the village of Lauris, and off the Alpilles and the Montagne Sainte-Victoire painted by Cezanne. You will cross the Durance to ride up the chain of Cotes. Mass covered with beautiful pine and oak forests with beautiful forest trails. You will make a stop at the Chapelle Sainte-Anne-de-Goiron, Roman style, lost in nature, which was a hotbed of resistance. Then you ride down to to Pont Royal. End of the ride. Drive back at Mas de Recaute at the end of the afternoon. 12/31: Second day trail ride. Pont Royal - Lauris. Transfer to Pont Royal. Focus on the Durance. Through the orchards, you ride down to the river. You will discover the wild landscapes that contrast with the cultures of this beautiful valley of Provence, then you enter the Luberon overlapping the valleys shaded overhanging cliffs, home to many raptors including Bonelli's Eagle. Arrival at Mas de Recaute in the afternoon. Provençal diner end new year’s Eve. Horse ride around the famous Montagne Sainte-Victoire, a limestone mountain range that served as the inspiration for many of Cezanne's paintings, as well as Pablo Picasso and Wassily Kandinsky, who fell in love with the contrasting landscapes. Take in bright white limestone cliffs, the blue of the sky, the green of pine forests and the red clay at the foot of the mountain on your inn to inn riding holiday in this picturesque French area. In hotels and guesthouses in 2-3 person bedrooms. Single bedrooms available with supplement. On a riding vacation around the famous Montagne Sainte-Victoire, discover why famous painters like Cezanne fell in love with these contrasting landscapes. The bright white limestone cliffs, the blue of the sky, the green of pine forests and the red clay at the foot of the mountain offer a mosaic of natural landscapes. Sunday: Transfer from Aix-en-Provence train stations or Marseille airport, or metting directly at Mas de Recaute. Welcome aperitf with your guide. 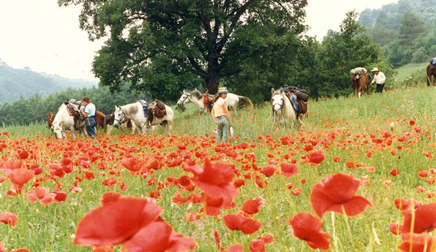 Monday: Ride in the Luberon nature park to try your horse. After lunch you will load your horse in the truck and you will be transfered with our minibus to Saint-Paul-lès-Durance, old Roman fluvial harbour used to transport wood and many goods from the Alps to Marseille and the Mediterranean coast. You will start your ride on pleasant trails in woods and along vineyards to arrive in Jouques following an old roman way. After riding through the village we will reach the wonderfull bed and breakfast the Catalan. Tuesday: You will ride in a typical Mediterranean forest. Pine trees, green oaks, and many herbs such as rosmary and thyme will perfume your ride. You will follow the old Verdon canal, built in 1865 to bring the Alps water to Aix-en-Provence and it’s numerous fountains. Riding to the North of the Sainte-Victoire, you will discover many sheepfolds and Roman ruins. A copious lunch prepared by our assistant will wait for you under pine trees shade. The afternoon, you will ride among brooms to the Bimont lake. Overnight near the village of Vauvenargues, famous for it’s castle, bought in 1958 by Picasso, where he used to live until 1962, he is lying in the park of the castle.Bus transfert to go to eat and sleep to the bed and breakfast the Catalan. Wednesday:After breackfast transfert to Vauvenargues where the horses are waiting for us.You will start your ride on the North of Mount Sainte-Victoire, to reach the Sinne pilgrim oratory, now a sheep pasture. You will follow the Gardiol forest and ride along the Vacon stream toward Rians, important crossroads between the Alps and the coast. The tradition says that Hannibal took this road to pass the Alps before his Rome conquest. Dinner at the restaurant and night at the hotel in the village. Thursday: Leave the vineyards and ride toward the South sunny side of the Sainte-Victoire. Discover high white limestone cliffs contrasting with the green forests, and imagine Cezanne walking on these perfumed trails, before arriving to the village of Beaurecueil. Dinner at the restaurant and night at the hotel. Friday: End your ride around the fascinating Sainte-Victoire Mountain to the west. Then, pass a historic Roman aqueduc. A trail will lead you to the Bibemus stone quarry. From the antiquity until the 18th century, monuments in Aix-en-Provence area were built with these unique red stones. Cezanne fell in love with these diverse landscapes. He created 11 oil paintings and 16 aquarelles of this place. The ride will finish near Aix-en-Provence at Saint-Marc-Jaumegarde where you will enjoy the last lunch in an auberge, a French country inn. In the afternoon, you'll be driven back to Aix-en-Provence to visit Cezanne’s workshop. Walk in the town and enjoy some shopping. At the end of the afternoon, you will be transfered to Mas de Recaute if you left your car, or to the train station or airport. My daughters and I experienced one of our best vacations together on our ride. The countryside was beautiful, the food superb, and the company friendly. Our hosts were warm, considerate of riders and horses and humorous! Our ride was quite nice. It's name was Springs and Hills of Provence, and it searched out the water sources of Provence essentially. We rode about 5 hours each day. Our guide, Nicole, was wonderful. We were able to see parks and mountains and vineyards, wineries (including one tasting), and we even rode a couple little towns such as Lauris and Vaugines where we got a private tour of a century-old monastery-church ... The staff and Didier were very welcoming. The food was very good. They were nice about my vegetarianism. The horses were very well suited to each rider. I loved my horse. I would definitely recommend this outfit to future riders. It's not fancy, but it was exactly what I was looking for. Very casual, very friendly, and comfortable (upgraded accommodations can be offered on request). It was a very nice holiday for me-- one of the best one in my life! Not only because of being with the horses, but also with a very nice group, brilliant food, unlimited wines and our special guide Jeff. I enjoyed very much and I'm already missing Stan a lot! When I was on the plane, I got so emotional, being so sad to leave Provence that my tears ran down from my eyes. But I wish we can meet again in some days in the future, and will have fun again. When not in the mountains, we rode past vineyards drooping with late grapes, orchards of apple trees weighed by bright fruit, and groves of olives trees, whose twisted trunks showed how little artistic license Van Gogh really had exercised in his landscapes of Provence. Rosemary grew wild and bush-size in the mountains, along with lavender, wild asparagus, juniper and thyme. The bouquet was almost as heady as pastis... From a breakfast of cafe au lait and croissant to Pascal's lunches to our splendid dinners, we savored France. At a farm near the Alpilles, we tried roasted guinea fowl (tastes like chicken); in the Camargue, salty bull steaks and spicy fish soup.... I was still finding sand in my ears the next day when we did another grand gallop. The second time around was the same -- an adrenaline rush. If you want to experience the heart of France, don't see it with your nose pressed against a tour bus window ... ride a horse through Provence", recommends Beth Meyer, a former Time Inc. reporter from Boston. Beth did just that, signing up with her 11-year-old daughter, Halsey, for five days of riding inn to inn through the foothills of the Luberon mountain. During this week in June, they experienced the France of Cezanne, Van Gogh, Gauguin and, of course, Peter Mayle. National Bestseller! This book takes place in the area where you will ride on this riding vacation and is a great read for your travels! Updated frequently, Fodor’s Provence & the French Riviera, provides the most accurate and up-to-date information available in a guidebook. Fodor’s Provence & the French Riviera features options for a variety of budgets, interests, and tastes, so you make the choices to plan your trip of a lifetime. Intermediate to Advanced for all rides except the France Equestrian Training & Trails, which is suitable for beginners (with a little experience) to advanced riders. 12, unless the child is an exceptional rider. If so, 10.